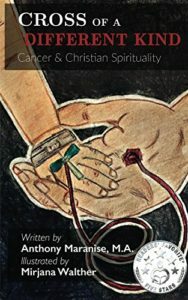 Cross of A Different Kind: Cancer And Christian Spirituality by Anthony Maranise is a comprehensive book focusing on cancer and the Christian walk. At the time of writing the author is cancer free for twenty years having had childhood cancer aged just five years old. The book is divided into three sections: those who have lost loved ones; those battling cancer; and the survivors of cancer. Each stage faces unique challenges. The overriding messages are that we are primarily a soul with a body and we have a God who loves us.